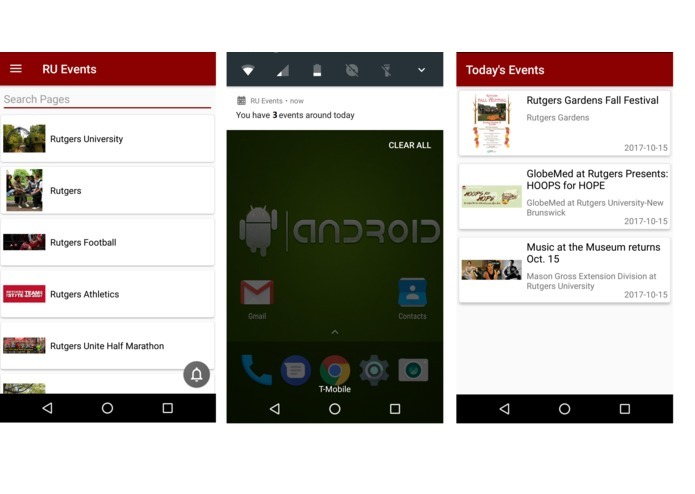 RU Events is an Android Application to fetch/RSVP/notify/search Facebook events happening at Rutgers! Rutgers each year organizes event to break one Guinness book of world records. Every year they are short of people joining the event. I thought why not make an app that will notify everything happening around the campus everyday! There are around 400 student and faculty organizations around all Rutgers Campuses. These organizations have their own Facebook pages where they create new events. As a student surely you don't want to miss out on these events! RU Events fetches all the events from Facebook associated with Rutgers and notifies you! You can search events, RSVP to them and stay updated everyday! I am a proud native Android Developer and I developed this app with Android Studio, Java, SQLite, Facebook Graph API, JSON parsing and various third party Android Libraries. Background service to collect everyday data was kind of tough as I have to take care of Activity lifecycle and debugging it. Facebook api is little complicated to use and I was manage to create whole android app within timeframe! Use of facebook graph API, data persistence, network status for internet connection. Scrape not only facebook but other social media and websites to collect events!